Andrew James Somers was born in Blackpool, on December 31, 1942. His father was a restaurant administrator and he had four sons: Tony, Richard and Monica, besides, of course, Andy. Andy spent his infancy in Bournemouth and he showed soon his fondness for the guitar. 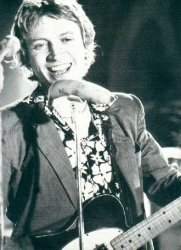 He specialized in guitar at school, and he began to play in the hotels till, at the age of 17, he was noted by Zoot Money. After his entering on "The Zoot Moneys Big Roll Band", Andy played around the U.K. and with that band he earned many approbation, mostly on the Mods places. In 1967 the Big Roll Band changed its name and style to fit itself at the growing Hippys movement: It happened like this that "The Dantalions Chariot" were born. However, the band doesnt received many appreciations, just for the unexpected changes. In this period Andy had a car accident that convalesced him and compelled him to leave the Dantalions Chariot project. When He recovered his health, played with Eric Burdon & The New Animals, which activity took place prevalently in the States, where Andy had been living there for six years after the band dissolution. It was just in California that he improved technique by studying the classical guitar and that he married Robin Lane, Neil Youngs chorus-singer. But their marriage didnt last long time, and so they divorced: That matter took Andy to pass through a deep crisis that he got over just after in the long run. After collected himself, he married Kate, which came back with him in England where, helped by a friend, he was included again in the musical turn-over, playing with Neil Sedaka, with the "Rocky Horror Picture Shows Band", with David Essex and with the "Kevin Coyne Band", where the old friend Zoot Money will join later. In the meanwhile, Andy changed his surname in Summers. In 1976, John Lord invited him in Munich to record an album in a rock quintet along with an Hungarian orchestra. It was just in Munich that Andy met Eberhard Schoener, that will collaborate with him in the following years. Still in 1976, Andy played with Kevin Ayers and, there in Newcastle, he met Stewart Copeland, which proposal to join The Police came, however, just one year later (May 1977), during "The Gong reunion project", in Paris, where Andy and Stewart will take part along with Sting.